What does the parade have to do with writers, editors and artists? Well, we have been hurt as much, if not more, as industrial and service workers. Full-time writing, graphic arts and editing positions have been replaced by freelance workers. Herb Boyd call’s them “Fee-Lance Writers.” But too often that fee is not high enough to support a writer. Contracts are broken, fees never paid, rights stolen… Desperate young scribes agree to write for free to build their resume, depressing rates even more. The attacks on writers are an attack on a free, educated, engaged society. The world needs strong, independent writers. We need investigative journalists to challenge the corporate abuse of power and wealth. We need poets to lift our spirit and show us the world in a fresh and provocative light. We need storytellers to reflect on the issues and currents roiling through our age; stories that inspire us and teach us about justice, heroism, community and identity. We need songwriters to stir us, historians to illuminate the future by reflecting on the past, and technical writers to explain how things work. We share our precarious economic position with many across occupations. And our hopes for better working conditions rest not only in writer and creative artist organizing, but upon the broad coalition that Labor Day represents. Do not doubt that political hatchet men and corporate managers will be watching to gauge how strong labor’s presence will be on this historic day. A poor showing encourages them to redouble their attacks on us. A strong showing gives them pause, and underscores our resolve. The parade is an opportunity for labor to show we will fight and win our rights to a stable, prosperous life for ourselves and our family. 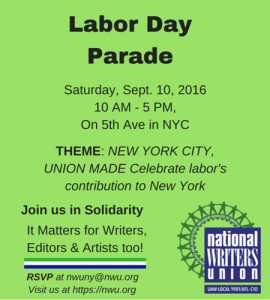 Send the National Writers Union an RSVP to nwuny@nwu.org that you will march with your brothers and sisters on this day. Logos will be available from the CLC web site to download and reprint. T-shirts will be available with the logo at the march. There will be an 8 a.m. labor mass that’s open to all faiths for those who want to participate at St. Patrick’s Cathedral. The organizers will try to start on time, even a bit early if the weather is bad. At 7 a.m., Vanderbilt Ave between 44th and 48th will be closed for assembling. NWU and UAW members will meet at 11:30 am on 46th St. between 5th Ave and Vanderbilt Ave.
We are scheduled to enter the march at 12:45 pm. If it is raining, the march may mobilize more quickly due to a smaller turnout, so we may begin marching closer to 12 pm. We will march north on 5th Ave to 64th St. In addition to the NWU National banner, it would be good to have a banner with a catchy slogan that shows off our writing chops. Would anyone like to volunteer to paint a sheet or sign? Those who want to remain may assemble in the bleachers at the viewing stands at 63rd St., but you will need to request a pass to join in the viewing stand. Would anyone like to identify a coffee shop, restaurant or pub where we might meet at the conclusion of the march to gather, celebrate, trade stories, etc. ?